A Party Leader’s speech is a special occasion for any party conference. And last week’s Ed Miliband conference speech at the Labour party conference in Liverpool was no different. A very special occasion for his audience. Was there a special theme to this speech? In part, yes. Because this Miliband conference speech took responsibility for the errors of the previous Labour government…and that’s a theme that he’s taken many times in the year since he became Leader. His introduction featured a neat Liverpool reference to Neil Kinnock’s speech at the Labour party conference in October 1985. That speech was a barnstorming feat of rhetoric. Because it certainly turned the tide in Neil Kinnock’s favour. 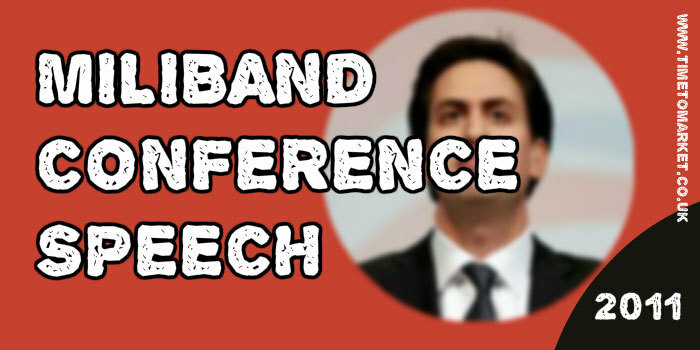 However, this Miliband conference speech was not its equal. But a slow start led in to some solid content and good ideas. His delivery remained slow and steady as he outlined these ideas. His comic timing is not quite right, but he tried some funny lines which proved effective. More seriously, his timing was not right when he mentioned Tony Blair in a list of previous Labour Leaders. The result? A quiet chorus of boos and jeers for Tony Blair. That was a pity because many of the best parts in this Miliband conference speech leaned heavily on Tony Blair’s speech at the TUC conference in 2001. He mentioned the “new bargain” some five times. Contrasts work well in the majority of speeches, but this speech, if it’s remembered, might be noted for its challenge to “bad” business. This Ed Miliband conference speech did sound more like a policy review paper than a conference-rousing speech. It didn’t have the tone of Tony Blair at the TUC conference ten years ago and it most certainly wasn’t on the same level as Neil Kinnock’s 1985 conference speech. But many of the techniques that worked in this speech proved equally effective for his predecessors. You can discover plenty of public speaking tips with our series of tips, podcasts and videos for public speakers. And, when you are ready to boost your public speaking skills even further, then please don’t hesitate to get in touch.